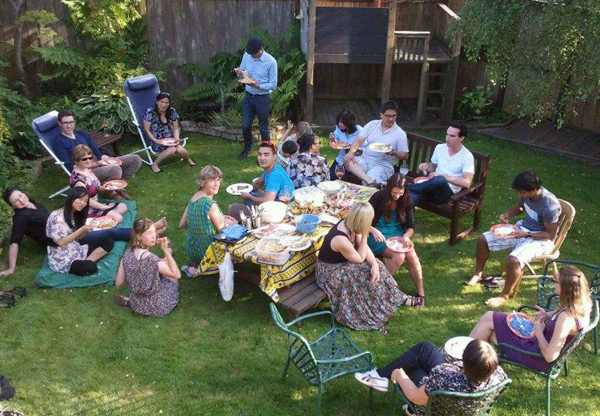 Thank You for Supporting Harm Reduction Services and Strategies in BC! In this second issue of the Toward the Heart E-zine, we summarize some of the latest research and evaluation on harm reduction, feature current activities throughout the province, and provide resources for education and support. 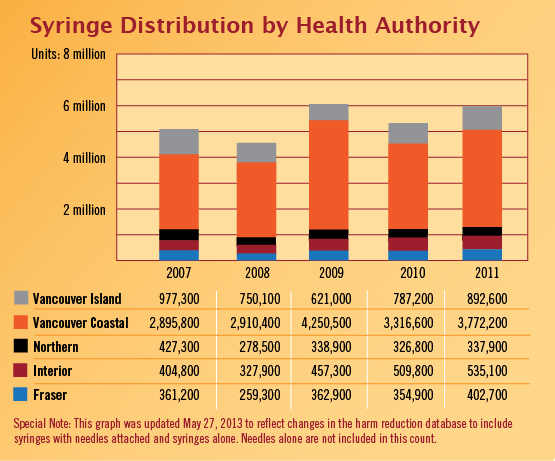 In 2011, the BC Harm Reduction Program delivered more than 6 million needles/syringes to harm reduction distribution sites across the province (see the map above). These sites then sent needles/syringes, along with other harm reduction supplies, to various services in the local community to increase our reach. 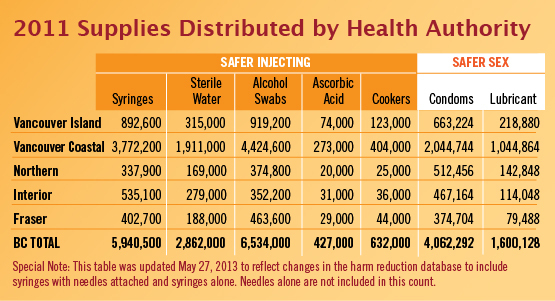 For more information about our harm reduction distribution sites check out our Indicators Report. The BC Harm Reduction Program has shared details of the BC Overdose and Response program (including Take Home Naloxone). 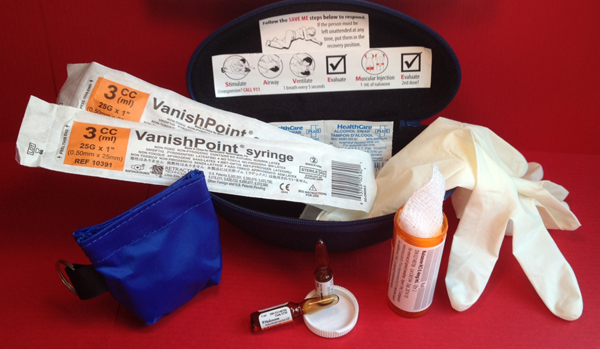 The details of the program can be found on our new Naloxone webpage. We would like to thank everyone for their contributions in creating this program. By working together we hope to decrease morbidity and mortality related to opioid overdose. Support for and understanding of safer inhalation supplies is lower than safer injection supplies among British Columbians. Distribution of safer inhalation supplies is important because many people who smoke drugs do not inject, therefore without safer smoking supplies these individuals may not engage with harm reduction and other health and community services. Safer inhalation equipment may prevent damage to the lips and lungs and the spread of diseases like HIV, hepatitis C, tuberculosis and pneumonia (Kuo, 2011). In addition, linking people to harm reduction sites connects people to health care providers, and then to treatment and primary care. In 2011, the BCCDC distributed 89,700 feet of vinyl tubing (which is cut into approximately four inch legths for use as a mouth piece) and 301,400 push sticks. Brass screens are also available. Click here for more information on safer inhalation supplies. The BC Harm Reduction Program would like to thank the students who have contributed to our program. Since January 2012 we have supervised over a dozen undergraduate, master, and medical students, and that's just the tip of the iceberg. We appreciate their help and hope their time with us will shape their career in caring for and working with people who use drugs.